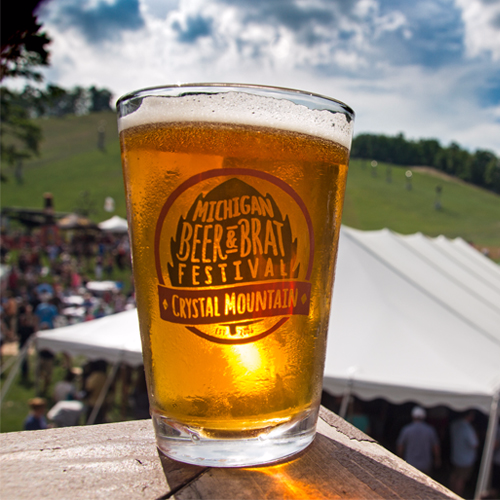 Kick off the summer with this Memorial Day weekend tradition at Crystal Mountain. Enjoy live entertainment while sampling an enormous selection of Michigan’s finest microbrews, local hard cider, mead, wine and gourmet brats from northwest Michigan markets. Admission at 3 pm (one hour before general admission), one (1) beer glass (9oz), 20 tickets and exclusive access to two brews on our Special Reserve Trail during VIP hour. Tickets can be used toward a wide selection of Michigan craft beers, brats and delicious sides! No refunds. VIP Admission: $60 per person (Ages 3 & under are free). Admission at 4 pm, one (1) beer glass (9oz) and 10 tickets. Tickets can be used toward a wide selection of Michigan craft beers, brats and delicious sides! No refunds. General Admission Pricing: February 19 - May 24, 2019: $30 per person. (Ages 3 & under are free). Event Day General Admission Pricing (May 25): $35 per person. (Ages 3 & under are free). Additional tickets will be available to purchase at the festival for $1 each. Crystal Mountain asks that you please be responsible about your alcohol consumption. We encourage our guests to assign a designated driver or use on-property shuttles when leaving the festival. Cars left overnight will not be ticketed or towed. Those who choose not to drink at the festival will still have to pay the same price for admission as those who are drinking. All attendees have access to a lineup of musical talent, food and beverage vendors, merchandise, festival activities and prizes. For this reason, discounted tickets are not available.